The Amish Pine Wood Bookcase stands 6' tall and the shiplap back brings in a rustic feel. There's plenty of room to house your collection of books and photo albums. This bookcase is made of solid pine wood and you can create the exact look you want with numerous finish and distressing options. Pine wood is a softer wood, yes. It still offers the stability needed to craft fine solid wood furniture. Pine is offered at a lower price for solid wood and it's a dream to finish since its fine wood grain accepts stain and paint so well. Distressing is also a popular choice for pine to create a weathered and worn look. 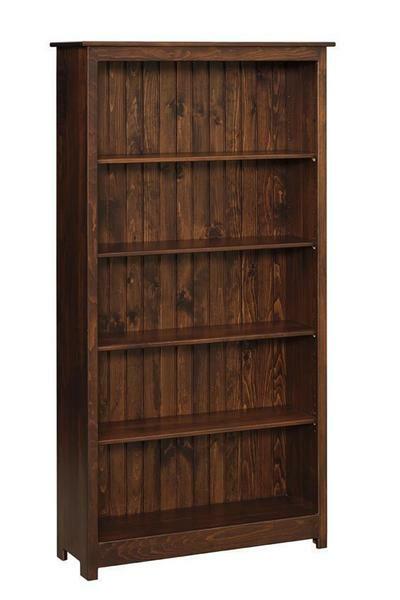 At DutchCrafters, we offer an exciting variety of wood bookcases, all made in Amish country. This collection includes barrister bookcases, bookcases with sliding doors and bookcases with storage drawers. Please email or call us with any questions about our bookcases or any of our Amish furniture. Thank you all so much for all your help with the selection and purchase of my furniture. The furniture was delivered on Friday and it is beautiful. My husband and I are so pleased. their hard work. Hopefully, we will be able to buy more furniture in the near future.